Kyle is one of our Poly-Level foremen for Canadian Concrete Leveling. He worked for 5 years at Poly-Mor prior to working with us. He has been with Canadian Concrete Leveling since 2016. Kyle maintains and runs the poly truck, assesses job requirements, installs the polyurethane lifting agent, installs nexus pro crack and joint sealant. He trains his partners so they can run their own truck one day. Kyle loves the fact that every job needs to be assessed and handled differently. He likes driving which is something that is involved when going to different job sites. Kyle likes surpassing customer expectations and meeting new people every day. When Kyle isn't working he enjoys playing the bass or going to the shooting range. He loves our Toronto sports teams and watches them play whenever he can. Over the past couple of years, our customer's front step had sunken dramatically and cracked as a result. It became a significant safety concern for our customer and their family. Our team used our PolyLevel® and NexusPro® Joint Sealant to lift and protect the concrete from any further settlement. Our customer is hugely impressed with our service and happy that they did not need to rip out and replace the concrete. Our customer in Mississauga, ON, was worried about their pool in their back yard. The pool deck had started to sink near the diving board. The homeowners could see that voids were beginning to be created under the rest of the pool deck as well. The sinking started shortly after the homeowner had maintenance work done surrounding the pool. Since the soils became quite loose, the weight of the concrete compressed these soils leading to a settlement in various areas. Unfortunately, water was making its way through the rotting control joints. Once John DiNicolantio, Project Lead, had a chance to discuss the issues with the homeowner he knew our PolyLevel® Foam System would be able to fix all the problems around the pool. Foreman, Kyle McKeown, injected NexusPro® Joint Sealant and polyurethane foam into the concrete to fill in the gaps and voids. He merely drilled dime-sized holes in the concrete to insert the foam under the concrete to fill in cracks, stabilize the substrate and eliminate trip hazards around the pool. The homeowner was grateful that we were able to provide them with a cost-efficient, permanent solution to their concrete problem. The homeowners can now safely enjoy their deck knowing the pool area is now completely stabilized, and the concrete answer came with a 10-year warranty. It was a big concern for our customer to have such a significant height difference in their front steps. Their elderly parents struggled to get up the stairs without assistance, and it became a huge safety issue for the family. Our team injected PolyLevel® under the concrete to lift and stabilize the sunken steps. This system works by compressing down on loose soils to raise and support the slab. Our customer now has peace of mind knowing their front entrance is safe for their family. The driveway had sunk at the base of the garage making it challenging to enter a vehicle. Our customer wanted to fix it before it got worse causing significant damage. 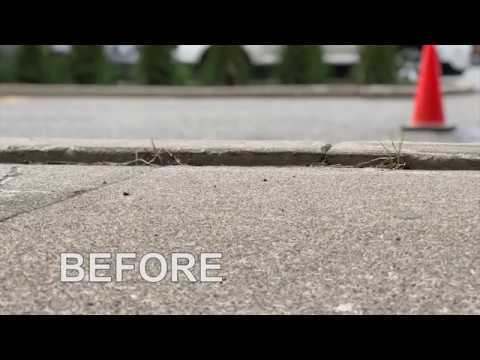 PolyLevel® was injected under the concrete to lift and stabilize the sunken driveway. This injection works by compressing the loose soils under the slab and forcing the concrete to lift. The driveway is now level with the entrance to the garage. A home in Toronto, Ontario had a problem located at the side of the home along the concrete walkway. The concrete walkway was sinking in various places along the house with the vast majority of the slabs sinking towards the foundation. The sinking concrete was causing trip hazards, and water was flowing towards the foundation. If it continued, it could lead to future basement and foundation problems. The customer called Canadian Concrete Leveleing, and John DiNicolantonio explained what would be done to help fix the problem. Kyle McKeown and the team came in and used the PolyLevel® Foam and NexusPro® Joint Sealant. The foam followed the path of least resistance beneath the slabs to fill all of the voids and lift the concrete. The NexusPro® Joint Sealant is then used to seal the gaps to prevent water from damaging the foundation. The customer was happy we could eliminate the risk of future foundation damage and rid them of all trip hazards. A customer had issues with a settled and cracked concrete pool deck. After contacting our company, our team injected our PolyLevel® underneath the slab. They began by drilling small dime-sized holes through the concrete slab and inserting the polyurethane foam. It follows the path of least resistance, pushes down loose soil underneath, fills the voids and makes the concrete level again. This process helps to protect the entire area against any future settlement.